This is an extra milepost added by the Trent and Mersey Canal Society in 1985. 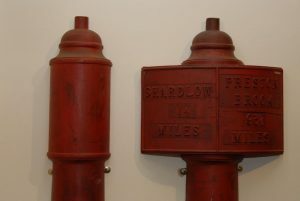 The original mileposts started at Shardlow (1 ½ miles from the junction with the River Trent). It is an exception to the rule that the numbers on the mileposts always add up to 92. Unless of course you consider that this post is actually 1½ miles beyond Shardlow. This would make the Shardlow distance really -1½ and the maths works again (with -1½ and 93½ adding up, as usual, to 92). This milepost and the unusually large plaque were donated and erected by Pat and Jeff Clinton, and the 3 branches of the East Midland Region of the IWA. It was unveiled on Sunday 20th January 1985 by Her Grace the Duchess of Devonshire.